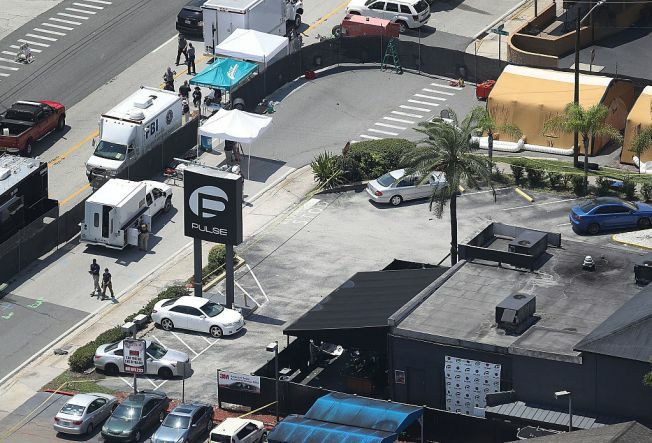 She plans to use the space, where a gunman killed 49, to create a "sanctuary of hope"
The Pulse nightclub in Orlando, Florida, is seen on June 15, 2016, after Omar Mateen killed 49 people there. After the city said it would buy the property to make it a memorial, the owner changed her plans and said she will create a sanctuary and welcoming area for people to reflect on the rampage. The owner of the Florida nightclub where the worst mass shooting in modern U.S. history took place said Monday that she is no longer interested in selling the property to the city of Orlando. Pulse nightclub owner Barbara Poma said in a statement that she can't walk away from the property, where 49 people were killed and dozens more injured during a massacre last June. Gunman Omar Mateen, who was killed in a shootout with SWAT team members after a three-hour standoff, pledged allegiance to the Islamic State group. Poma said she plans to use the space to create a "sanctuary of hope" and a welcoming area where people can reflect on those affected by the tragedy. "I feel a personal obligation to ensure that a permanent space at Pulse be created so that all generations to come will remember those affected by, and taken on, June 12," she said. People in Orlando waited hours for a “One Pulse” tattoo on June 18, 2016, to show support for the Pulse night club shooting victims. The tattoos were free at Realm Tattoos but supporters were encouraged to leave donations for victims, which will be distributed by Southern Nights nightclub in Orlando. Last month, the city of Orlando announced plans to purchase Pulse and eventually convert it into a memorial. The city had planned to pay $2.25 million for the gay nightclub property. City spokeswoman Cassandra Lafser said in a statement that city officials respect Poma's decision "and are hopeful the Pulse site continues to be a place of hope and healing that honors the victims." Since the June massacre, dozens of people stop by each day to lay flowers, stuffed animals or candles outside the nightclub located south of downtown. City staffers will continue to research how other communities have built memorials to tragedies, Lafser said. "We believe it is important for the community to have input into a memorial that honors the victims and pays tribute to the resiliency of Orlando," she said.